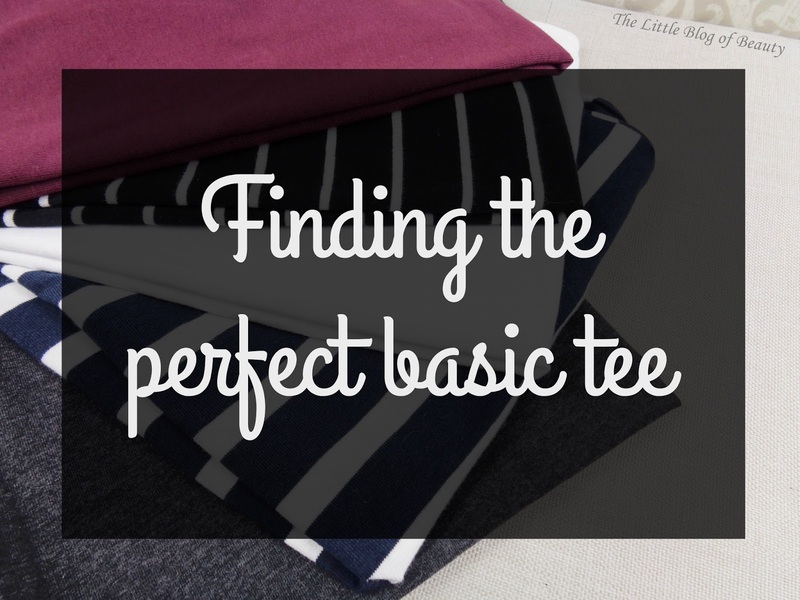 I love a simple, basic T shirt, but the problem is finding the perfect one. I moved house six months ago and when I moved I had a bit of a clear out as there's no point packing up things that it's time to get rid of. I threw a few of my basic tees out because they were past their best and somewhere along the line another one has gone missing, so I really needed to replace them. I asked my parents for some money for Christmas so I could go on a shopping spree to buy myself a few new bits, but the one thing I was actually dreading was tracking down the perfect basic tee. It's sounds a little over dramatic, but it's one item of clothing I really want to be perfect. It needs to be comfortable, a good fit and preferably made of cotton with some elastane so it maintains its shape. I hate anything too short (I'm tall), polyester and that just generally doesn't fit well, particularly that digs in under the arms. I thought I'd have to hunt high and low and that I might not find anything the first time due to not being able to shop for very long anymore because of my spine. But I was really surprised, and so happy, to find the absolute perfect basic tee in the first shop I walked into. Primark. Primark's basic tee's really are perfect. They're a really good fit, really comfy, good fabric and there's a good range of colours too. I only went for one vest type because it's not really the right time of year but I really liked the colour. I then went for short sleeved in black, white, dark grey, maroon and black and white striped and in long sleeved I went for black and white and dark blue and white striped. I'm a 10/12, probably a little closer to 12 just after Christmas, and I went for a 12 because I'm not sure about their sizing and they're perfect. Price wise, of course they're reasonable because this is Primark. I believe they're priced between £2.50 and £4 and I found two or three of the ones I bought came up cheaper than the price tag said when I got to the till. I don't know how long these will last because I've only just bought them and have only worn a couple of them once so far. But for that price to be honest I wouldn't mind replacing them yearly. For £20-£30 I can have a full compliment of basic tees from vests to long sleeved, plain and striped. This ended up rather a long post when it was just about a T shirt (or seven! ), but I am so pleased I have found the one! Where you do you get your perfect tees from?